Abbeycroft Leisure was formed in 2005 to manage 2 leisure centres. It has since grown considerably and now manages 8 leisure centres on behalf of West Suffolk Council; a combination of 5 sports centres, gyms, and health and wellbeing centres in Suffolk and Cambridge; along with a sports development and outreach programme for the local communities we operate within. Suffolk has a rural and urban split which provides Abbeycroft Leisure with interesting and creative opportunities to attract the local community to participate in physical activity. Abbeycroft Leisure aims to increase the number of physically active people in Suffolk, raising awareness of the benefits of a healthy lifestyle, and in so doing increasing the health and wellbeing of local communities we operate within. 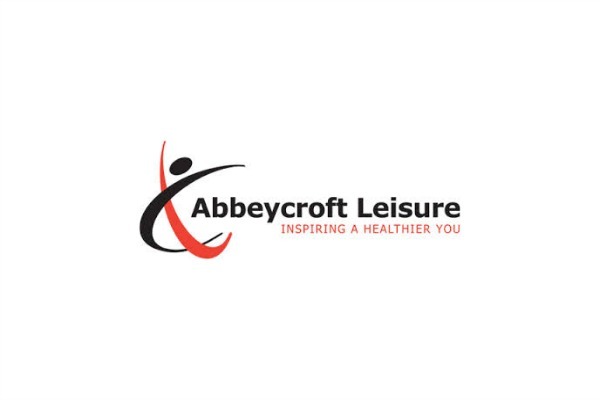 Abbeycroft Leisure operates 19 leisure facilities, ranging from traditional leisure centres to dual use school facilities and yoga and wellbeing centres. We use these facilities to support a range of services beyond the sports, gym and swim activities. These include GP Exercise on Referral Schemes known as ‘Active Living’; Cancer Rehabilitation Swim session; Disability sport sessions; a programme of activities for over 55’s; and Falls Prevention sessions in partnership with the local NHS team. We have developed a Stakeholder Forum where we work with advocates to influence and lever opportunities to develop and extend our work and our reach. This has led to a number of funding allocations being released. An example of this is with Active Mums™ a programme working with expectant ladies with a high BMI to reduce risks of pregnancy and childbirth, and encourage the adoption of a healthier lifestyle. This programme also reduces isolation and tackles smoking issues and is currently being rolled out in new areas across the county and has seen cost savings for the NHS as the number of caesareans amongst participants is much lower than those not attending. One facility has recently won awards for its dementia friendly work ‘Together Tuesdays’ and this is something we are looking at rolling out across all facilities in order to increase accessibility. We have also invested time in understanding the health sector and local partnerships and networks in order to be positioned as a key partner in the delivery of physical activity as part of their prevention agenda and strategies, and through existing work are able to show a positive track record for successful delivery of initiatives. An Explore Outdoor programme works with schools and community events to offer outdoor physical activities that also supports increased classroom engagement. Young people now have a place to spend time at new Teen Chill Out sessions, after other services withdrawing from the communities. This also aims to have an impact on reducing anti-social behaviour, helping communities to feel safer. There is a framework in place that is used to create a logic model at the outset of any project design. This is then used to create surveys and baseline data in order to monitor, evaluate and report on changes that occur. These are usually reviewed on a six monthly basis and used in our annual reporting. The changes recorded are also explained to staff to encourage buy in with the process of recording data, but also to develop their awareness of the differences they are making through their day to day work. We currently produce an impact report alongside our annual report which is a visual booklet that highlights specific projects and the impact they have made on participants. It also highlights our partners, who and how we have worked with organisations, case studies, feedback and outputs. This is distributed to stakeholders and staff. 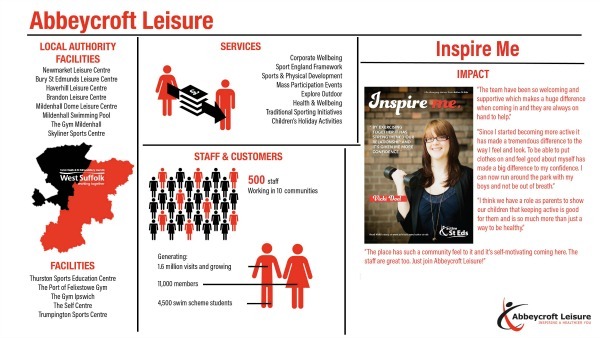 After introducing an Inspire Card which raises funds to support health and wellbeing initiatives, our plan is to use this as a mechanism for communicating with the public and customers about how the monies raised from this are used and how these initiatives have made a difference. This will take place through facility based promotion; social media and newsletters. A system called DataHub has been introduced. Once this is working fully, it will produce a social value (£) for users of our facilities, focusing on Health; Wellbeing; Education; and Crime. This will be used to demonstrate the positive impact being made on the communities we operate in. Active Mums™ – 80 ladies have been through the programme, experiencing benefits for themselves and their new born babies as stated below. The benefits have extended to whole families where healthier eating has been introduced, partners have quit smoking, and activities that involved being active have been introduced. Cost saving of £9,324 to the NHS based on 90% of 10 women having vaginal delivery, compared to the national average of 16% (maternity statistics 2018). The programme saw an average birthweight of babies being 3.635kg which is in line with the national average. For these ladies who have a high BMI this is a positive outcome. Average weight gain during pregnancy was 7.36kg which is a positive result with the expected weight gain being 10 – 12.5kg (NHS, 2011). We are currently monitoring changes in levels of wellbeing, however results are not ready for collation at this point. 14% increase in confidence in CV writing. 663 (86%) people remained active and moved into a membership, the effect of remaining active includes reduced long term conditions (or risk of), increased wellbeing, and reduced isolation. Keep Active – 907 people went through the scheme last year, of these 185 were aged 14 – 25 yrs, and 722 were over 55yrs. The main outcomes for these participants is experiencing reduced isolation and increased strength and balance / activity levels. 12 students at West Suffolk College received 150 hours of work placements, and gained the National Pool Lifeguard Qualification. 5 of these moved into employment with Abbeycroft Leisure. 9 Apprentices were recruited and 3 of these moved into further employment with Abbeycroft Leisure. We operate services and facilities in 19 locations across Suffolk, with one being in Cambridge. Predominantly serving the community of West Suffolk and Babergh District Council. At Active Mums™, ladies experience a supportive and non-judgemental environment. Working with small group’s means the facilitator can deliver a tailored approach. Time is always available to the ladies to have 1:1 conversations and no question is out of bounds or trivial. The ladies in this feedback attended weekly sessions throughout their pregnancy, where they were able to take part in light exercise, discuss topics relating to healthy lifestyles, birth, and babies, as well as receive their antenatal care in the same session. The young people attended Make your Move for 12 sessions over 4 weeks. They were offered support to enable them to attend the course, and were supported to apply for jobs during and upon completion of the course. The facilitators were able to provide an environment in which the generic course content was delivered but making it personal for each participant. Investment in providing free qualifications for students, with a view to equipping the next generation workforce with suitable workplace skills beyond the college qualifications. Our ethos is such that collaborative and partnership working is at the heart of everything we do, as long as it meets the needs identified and contributes to the bigger picture and broader strategic outcomes. This differs from ‘for shareholder providers’ as it means not being protective over potential opportunities, being truly open and transparent about solutions and capacity. Sharing resources to deliver outcomes for the greater good of the community rather than for Abbeycroft Leisure. Abbeycroft Leisure raised and donated £8,900 to charity last year through site fundraising and events for charity.